An mixer element lets you route audio and set levels for each output. 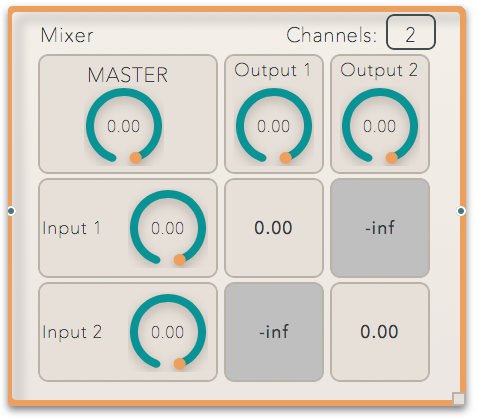 Mixer elements contain a matrix so you can mix every input to every output. Made of equal rows to equal columns, you can set the number of input/output channels via the Channels text box in the upper righthand corner. Master Level: Upper left corner. Input Level: First column under master. The mixer options look very similar to the expanded mixer element. Here, you can edit the name of the element, the channels in the element (input/output count), the master volume, reset levels, and all the levels in the mixer. Esc Key: This will stop all playing elements and reset the levels. Reset Levels Button: In Options Menu. Run a Reset Fade: In Fade Options Menu.